Christmas is the center of our history. We calculate the date from Jesus’ Birth 2013 years ago. For nonbelievers it is the year of the Common Era, but for us Catholics it must be unashamedly 2013 AD, anno Domini, the Year of the Lord. If we truly celebrate Christmas we will understand that God so loved the world that He sent us Jesus to be with us always, to be the Lord of History and the King of Hearts. Christmas is about God’s love breaking into our world, a flash of light in a darkened sky. The first Christmas carol was sung by the angels at Bethlehem and it is the basis of a prayer we often pray at Sunday Mass, the Gloria. Glory to God and peace on earth is the message. The two really go together. I f we do not give glory to God by loving and obeying Him, our human relationships are not going to be what they should and we will not have peace. The destroyer of peace is selfishness and sin. Jesus came to establish true peace based on our relationship with God and with each other. The first Christmas carol was a preview of Jesus’ program for a good life. Jesus’ birth in a manger teaches something about what is truly important. The center is Christ. The center is a baby. The baby is surrounded by loving parents and not much else. 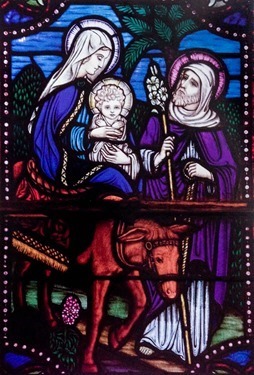 The love of Mary and Joseph is the only treasure the Christ Child has. Being born in poverty and simplicity is God’s way of speaking to us about what is truly important. 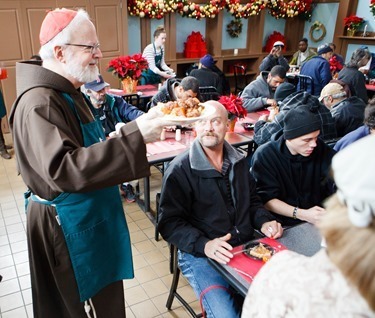 As we celebrate Jesus’ birth in the most humble of circumstances we are called to have compassion for the homeless, the poor, the sick and the suffering. God is calling us to share the gifts we have received with those in need. When we do that, we are giving gifts to the Christ Child Himself. May our celebration of Christmas be a time of recognizing that the greatest gift we have received is God’s love for us and the greatest gift we can give is to share that love with others. Last Friday I attended the annual board meeting of our Redemptoris Mater Archdiocesan Missionary Seminary. 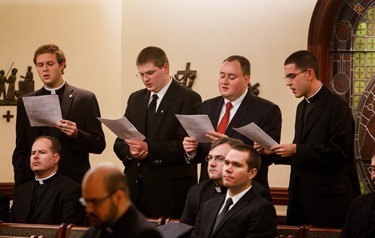 The seminary is progressing nicely with 25 seminarians currently in formation. Five of them are currently in the period of “itinerancy,” which is a period of time for them to experience missionary work. 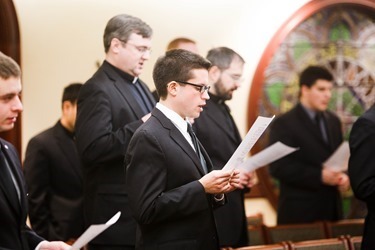 I will ordain one of the seminarians, Steven Clemence, a transitional deacon in January. 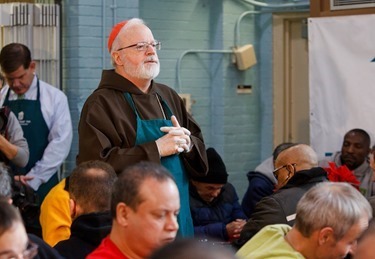 The rector, Father Tony Medeiros, gave a very hope-filled report, which included an update on preliminary plans to expand the facilities there. Afterwards we had a very nice lunch at the seminary. From there, we returned to the Pastoral Center for the board meeting of the Domus Jerusalem Foundation, of which I am the President, and Archbishop Charles Chaput of Philadelphia and Bishop Anthony DiMarzio of Brooklyn are vice-presidents. Since Archbishop Chaput and Bishop DiMarzio could not come to Boston for the meeting, they joined us via videoconference. It was an interesting experience watching each other on the screens. Giuseppe Gennarini and Ed Condon briefed us on the tremendous progress the Domus Jerusalem Foundation is making in raising awareness about the project to build an international Conference Center in Jerusalem. This year, two groups of pilgrims have visited the site and they also shared exciting news about the progress being made to secure the land with the hope of starting the construction next year. The center will overlook the Temple Mount and will focus in promoting dialogue and understanding between Catholics and Jews; it will be similar to the one already built near Tiberias, the Domus Galilee. 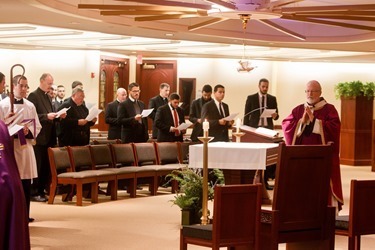 Then, in the evening we had a wonderful gathering at the Pastoral Center with all our seminarians studying at the different seminaries, St. John’s, Blessed John XXIII, Redemptoris Mater and our college seminarians who study in Providence. We began the evening with Mass followed by dinner, where we sang Christmas carols and other songs. 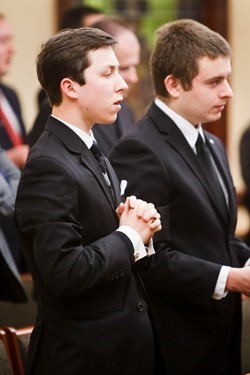 I gave each seminarian a small gift as a token of our appreciation. 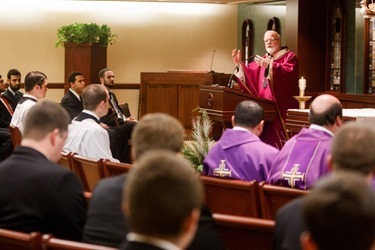 We were very pleased that almost all the seminarians were able to be with us. We are always anxious to have opportunities to bring them all together. 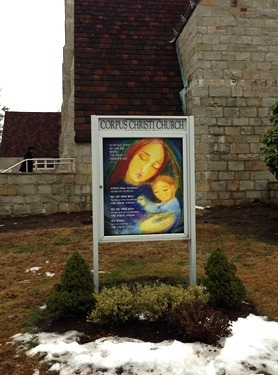 Saturday afternoon, I went to the Little Sisters of the Poor Jeanne Jugan Residence in Somerville to celebrate Mass for members of the Simon of Cyrene Society who often gather there. 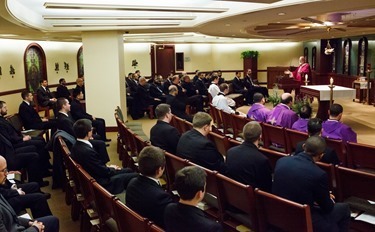 The Society was established by Msgr. 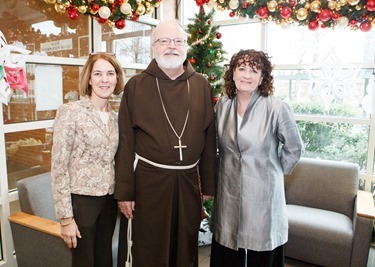 Thomas McDonnell and Sister Peggy Youngclaus SND, to help disabled persons and others who are in need of assistance. 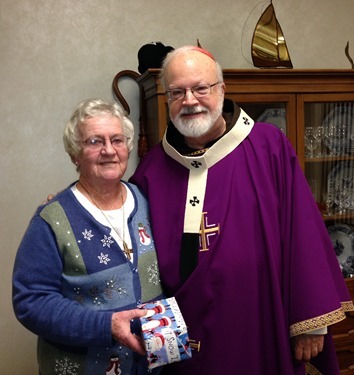 Sister Peggy and a dedicated team of volunteers have continued the work of the Society since Msgr. 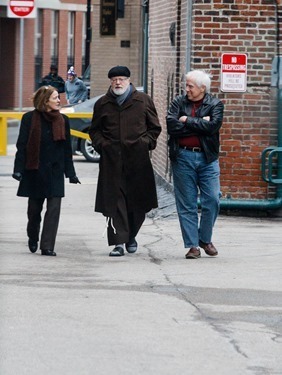 McDonnell’s passing several years ago. It is notable that Sister oversees this mission in addition to her many other responsibilities. Her commitment to the peoples she serves is extraordinary. One of the readings was proclaimed by a man who read the text through Braille, the Mass was very inclusive for all gathered. 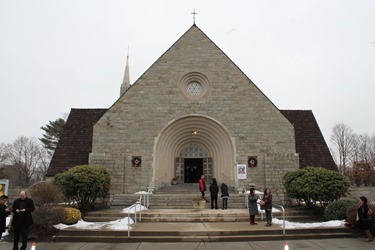 Many of the Jeanne Jugan residents attended the Mass. It was good to have them there to share in our Advent celebration. 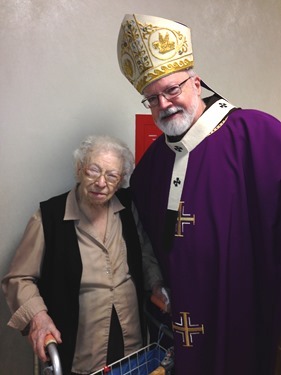 I had the opportunity to have my picture taken with Ann Glennon, who was preparing to celebrate her 106th birthday on Christmas Day. Ann felt that her birthday was getting too much attention and could only stay a short time for pictures because she had to get back to her room to continue the preparation for Christmas. There are numerous residents who have observed their 100th birthday and are moving forward each day with the grace of God. 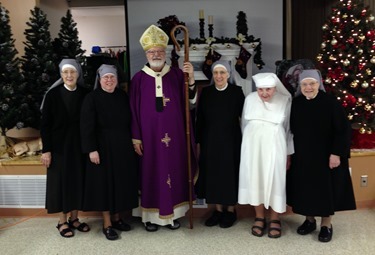 We are very grateful to Mother Gertrude and all the Little Sisters of the Poor for their uncompromising devotion to the care of sour senior brothers and sisters. 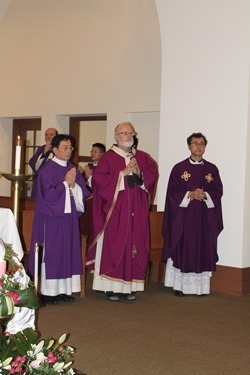 Sunday, I went to Newton for a Mass with the Korean Catholic community and to celebrate the establishment of their new parish, St. Antoine Daveluy. 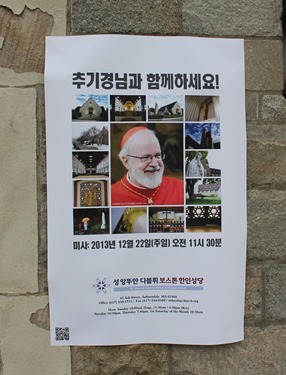 The parish is named for a French missionary who was martyred in Korea. 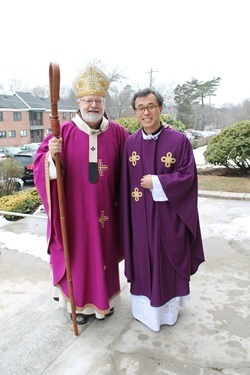 The Korean Catholic community is a wonderful presence in our archdiocese. 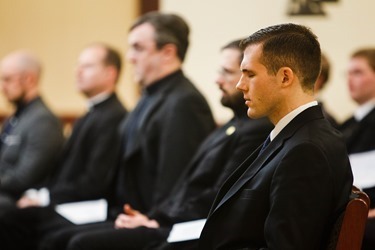 They take evangelization very seriously, as is indicated by the large number of people they always have in their RCIA program. 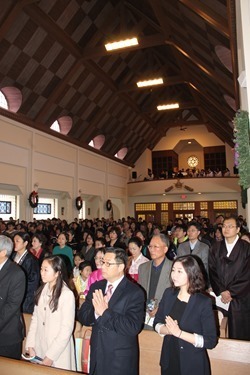 As part of their evangelization efforts, they reach out to the many Korean students studying at universities in the Boston area. They have a young adult Mass there every Sunday night that is very well attended. The church was packed and I was impressed to see how young the congregation was. I would say the vast majority of the people in the church were under 40 years of age. It was a wonderful Mass and I was also able to communicate to them that a member of the parish who is now a cloistered Carmelite Nun sent her Christmas greetings to the whole community. 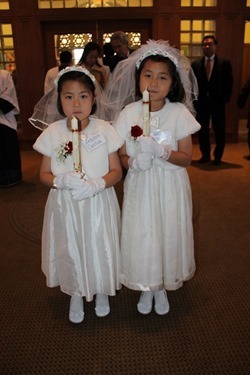 Also during the Mass two little girls, Cecilia and Christina, made their First Communion. Afterwards, there was a cake to celebrate the establishment of the new parish. 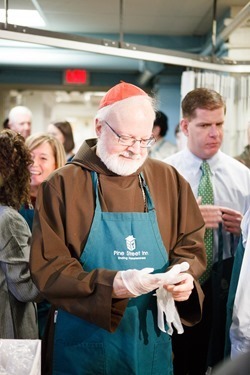 On Tuesday afternoon, Christmas Eve, as I do every year I went to Pine Street Inn to help with serving meals to the homeless. 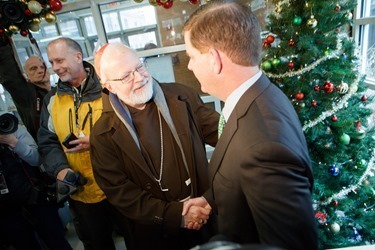 I was very happy to see that Boston mayor-elect Marty Walsh was also there with me. 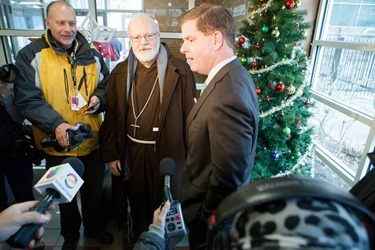 Going there with the mayor-elect and other public officials is a way of helping to raise awareness of the problem of homelessness in our community. 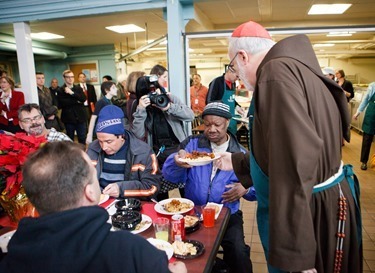 Of course, it is also an opportunity to be with these people who, in their homelessness, share the fate of the Holy Family at Christmas. 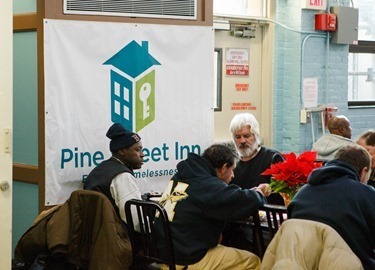 We are blessed to have Pine Street Inn, which was founded over almost 45 years ago, and has made an extraordinary contribution to our city in caring for — and advocating for — the homeless. One woman I spoke to was homeless because there had been a fire in her home and she has been there ever since. Others, even though they are working, do not make enough money to rent an apartment. 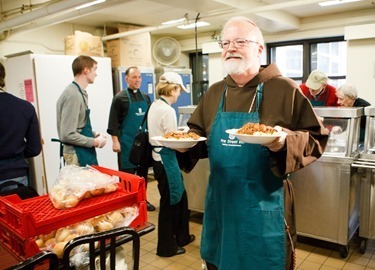 So, we see that though there are many different causes of homelessness, at Christmas time it can be particularly difficult to be homeless, no matter what the cause. This Christmas, with the weather that has been so cold, it is certainly even more challenging. We are so grateful to the director of Pine Street, Lyndia Downie, who continues to do extraordinary work there and to Our Planning Office for Urban Affairs, which works in conjunction with Pine Street to develop low-income housing to help move residents out of homelessness. That night, we celebrated Christmas Midnight Mass at the cathedral. In recent years, I have heard of several churches that have stopped celebrating Midnight Mass, but it is a tradition that we continue at the Cathedral. I think it is very meaningful to have the Eucharist celebrated at midnight on Christmas. Obviously, the full cathedral was an indication that many people agree with that assessment. As always, Father Kevin O’Leary and his assistants did excellent job preparing the Cathedral. The decorations were just stunning. 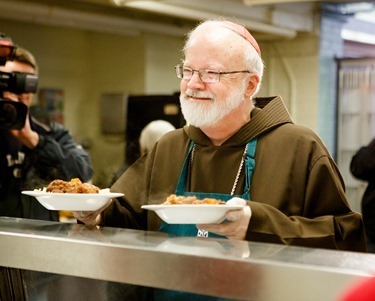 On Christmas morning, I visited St. Francis House. 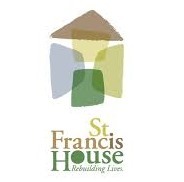 St. Francis House shelters some people overnight but also provides a place for those in other shelters to gather in a warm place during the day and offers many programs to help transition people from homelessness. 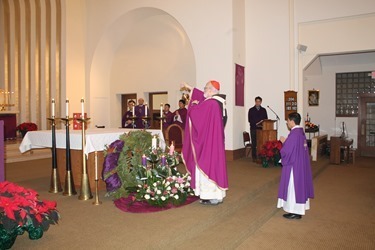 Every year, I celebrate a Christmas Liturgy of the Word there. We read the Gospel, reflected on it and sang Christmas carols with the residents and some of the volunteers. The executive director, Karen LaFrazia, is doing extraordinary job and we are grateful for her dedication. 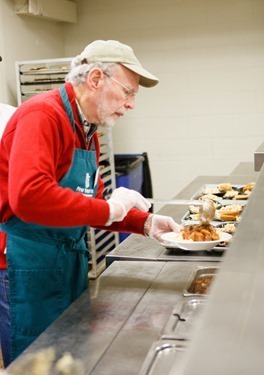 It was also wonderful to see the many volunteers who made time at this busy time of year to help others. Some even brought their children to help provide services to the homeless. I am sure that was a very meaningful experience for those young people.